This logic reminds me of the parable of the prodigal son. The younger son, who had besmirched his family’s good name by years of wild living, is welcomed back by his father, who puts a ring on the lad’s finger and has a calf fattened for the celebratory feast. But the older son, stunned by this act of complete grace, complains that he himself has been slaving away loyally for years without receiving remotely similar treatment. According to the New International Version translation of the book of Luke, the father replies, ‘you are always with me, and everything I have is yours. But we had to celebrate and be glad, because this brother of yours was dead and is alive again; he was lost and is found. If I were an American official looking towards the ‘southern anchor’ of its US alliance system, I would not doubt even for a minute that Australia is ‘always with me.’ But New Zealand has been different. The younger member of the alliance had left the family fold in the mid-1980s (or been shunned for standing up to its principles, according to some Kiwis). New Zealand had been knocking on the door again with its contributions in various places, including Afghanistan. And at a certain point the United States realised it was simply counterproductive not to have a more active relationship despite this difference of opinion. This was not about grace, however. It was about self-interest; there is no such thing as having too many close partners when you are worried about China. This looks like good diplomacy to me. But it may sound a bit strange in Canberra if you are used to a major power ally that does not ask whether you are on the team but how much are you going to contribute. Yet this is not what the warming US–NZ relationship is really all about. There are certainly areas of practical collaboration which are being worked out. Some of these are in the South Pacific, where there was a recent trilateral meeting involving Hillary Clinton at the recent Forum in the Cook Islands. Some more dauntingly have to do with maritime cooperation in the wider region, which if they are not handled well could get New Zealand into some deep water. But the main prize for Washington is a closer relationship with a country that has long had an independent spirit, and has endorsed the pivot. Having New Zealand on side (and the Washington Declaration is a strong statement of alignment if not a formal alliance) is a hard ball get. That’s the same New Zealand that has a free trade agreement with China, plenty of contacts but not too much baggage in the South Pacific, and a good reputation for supporting multilateralism. It was never about our strategic weight, something Australia is expected to offer in at least small portions. 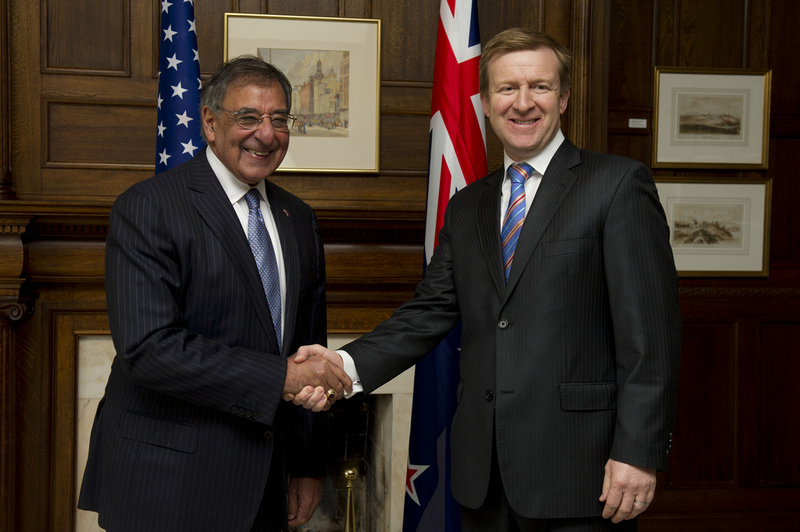 If I was in Washington I would be extremely pleased with Panetta’s visit. All the right buttons were pushed. In Wellington I’m wondering if New Zealand has been cashing in some of our hard won independence chips a little too cheaply. If I was in Canberra, I would be wondering whether New Zealand really has any interests at all in being quite back at the top table. It actually suits John Key’s government to have New Zealand’s nuclear free stance stand in the way of a full resumption of ANZUS. An informal and incomplete alliance relationship with the US is much more compatible with good relations in Asia with a rising China. We can walk and chew gum at the same time, at least for now. If this means that New Zealand doesn’t face some of the same expectations from Washington that Australia shoulders, even better. So don’t worry Peter: AUSMIN and Australia’s number one ally status in this neck of the woods are safe for some time to come. Fattened calf anyone? Robert Ayson is director of the Centre for Strategic Studies at Victoria University of Wellington, New Zealand. Image courtesy of Flickr user Secretary of Defense .